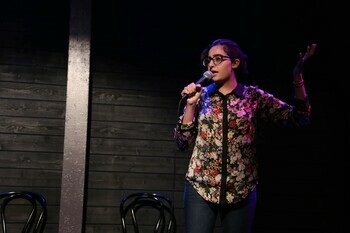 Stuti Sharma is an immigrant artist, stand up comic, clumsy poet, and educator based in Chicago. She's a poet in residence with the Chicago Poetry Center. She is a Leo sun, Virgo moon and only trust restaurants where the cooks are simultaneously facetiming family. You can catch her around the city doing shows and find her on Twitter at @cyborgstuti. Please join Stuti and our other amazing readers on Tuesday, April 2, 2019 in the upstairs bar at Hopleaf. Doors open at 7pm, and the show starts at 7:30. It's free, and 21-and-over. Please RSVP on Facebook. This page contains a single entry by Eden Robins published on March 30, 2019 12:25 PM. Meet Our Readers: Amar Taylor was the previous entry in this blog. Tuesday Funk #126 is tonight! is the next entry in this blog.